Valentine's Day is the time when most restaurants provide set menus that are often overpriced. So navigating the glut of options for a romantic meal that won't set your wallet back too far or leave you feeling overly stuffed can be harder than you might think. But one of my favorite places to go? Pumpkin on South Street. Better yet? 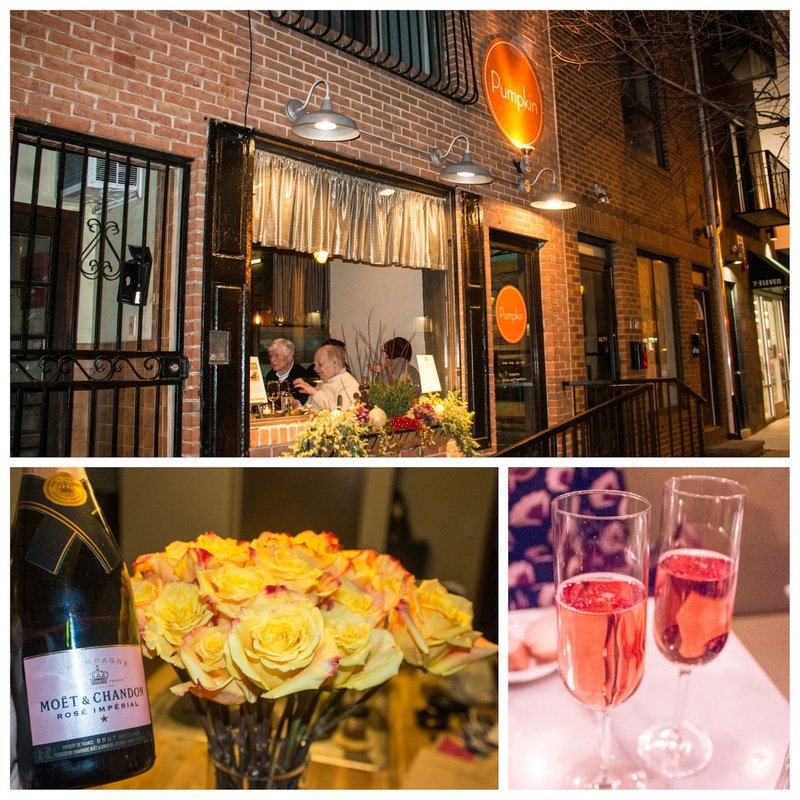 They're BYO - so bring on some bubbly to enjoy with your meal. We brought one of favorites - Moet Nectar Imperial Rose - subtly sweet, lightly tart, effervescently fruity - easily quaffable. Pumpkin had us put down a deposit of $50 ahead of time on a credit card. But that's less cash to have on hand since they're a cash-only BYO! 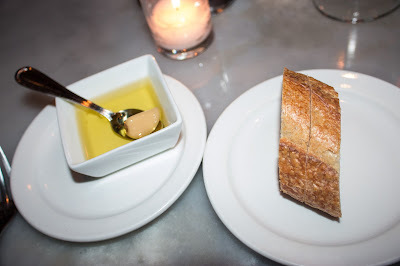 Our meal started off with sourdough bread that came with some fruity olive oil and a confit garlic clove. 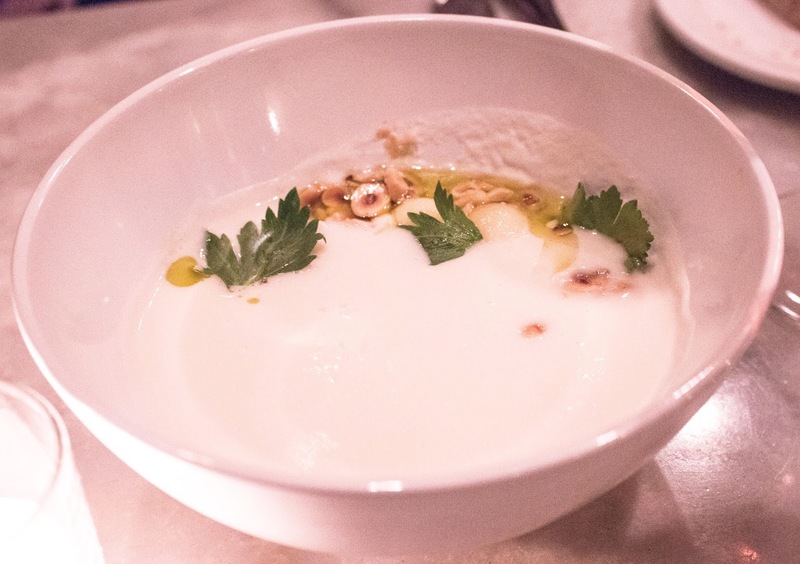 From there, the GF enjoyed her creamy cauliflower soup that was accented by the fragrantly rich hazelnut and balanced by the bright acidity of the apple and the freshness of the celery leaves. Pumpkin's take on octopus reached gustatory heights in my book and was easily one of the best iterations I've had. Lightly charred on the outside, the octopus cut like butter and was incredibly unctuous and satisfyingly savory. 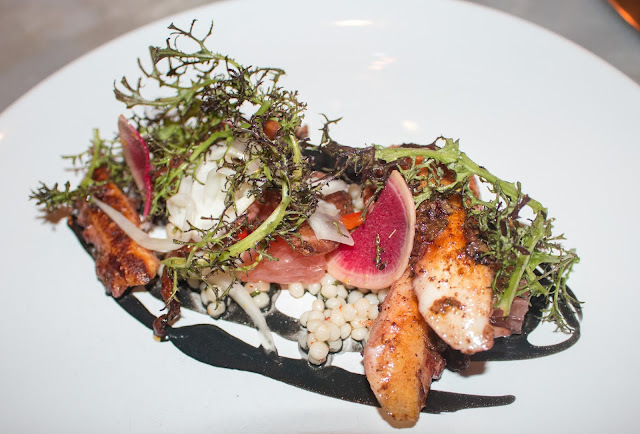 The squid ink provided some backbone to each bite, while the pink grapefruit segments offered some sweet acidity and the watermelon radish offering some countervailing balance. The couscous were moist pearls of caviar, filled with a moist and savory broth. Delicious. The GF and I both enjoyed this next dish, which featured wonderfully local and stone ground heirloom grits. The sweet, yet nutty corn essence could not be denied and was wonderfully paired with the rich taleggio fondue. 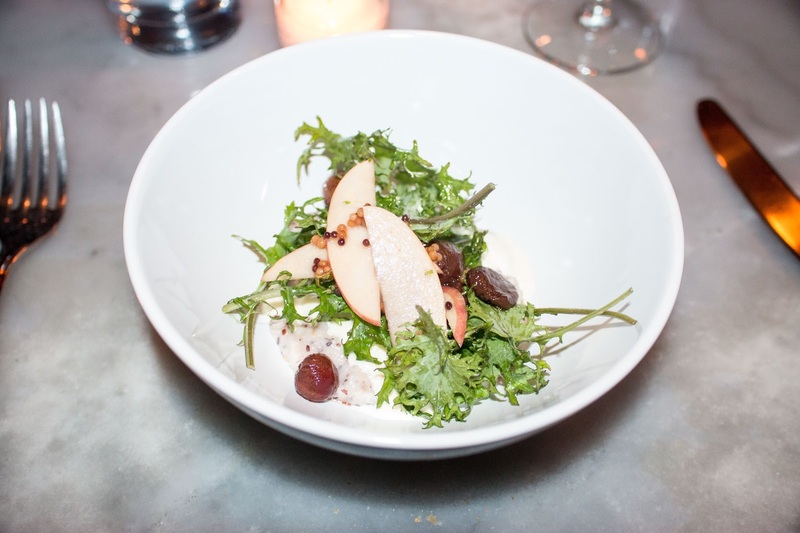 The saba and sweet roasted grapes were a surprising, yet welcome element to the dish, providing a wonderful juxtaposition to the rich cheese. 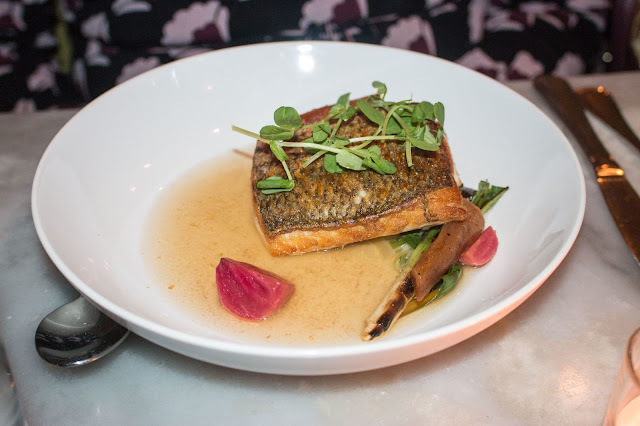 The striped bass was wonderfully cooked - the fish was moist and the skin was crisp. The dashi broth was poured tableside and added some nice smoky elements to each bite. The leeks and salsify complemented the broth nicely, while the beets offered a break in the form of some subtle sweetness. American wagyu was on offer tonight and came appropriately medium rare. Well-seared and seasoned, the sirloin cap featured some great beefiness. 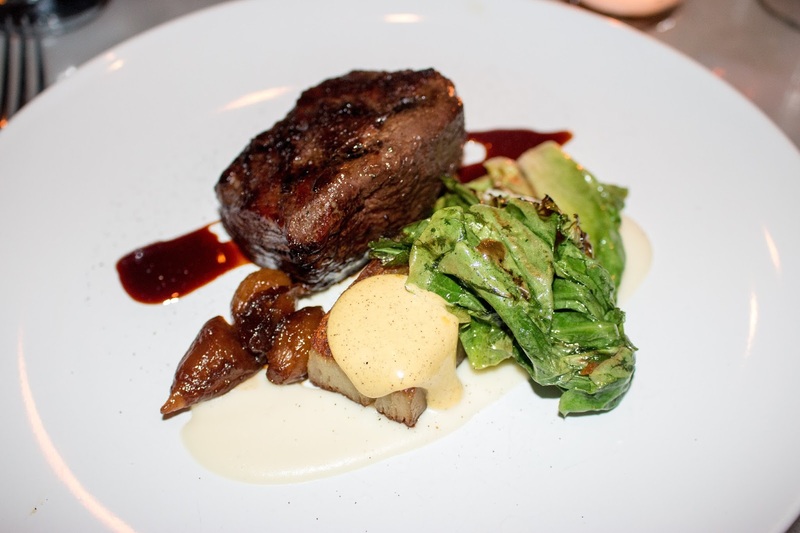 The accents of star anise in the bordelaise wine sauce were stellar, with the caramelized pearl onions imparting some additional savoriness to each bite. Technique was showcased in the form of the creamy and crisp potato terrine, which was topped by a sharp cheesy fondue. 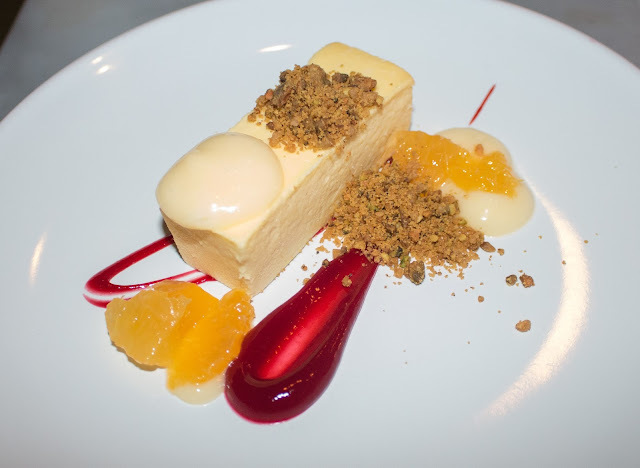 The goat cheese cake had a wonderful tang and I appreciated that it wasn't overly sweet on its own, though the tart raspberry sauce and the citrus segments helped to bring it back to traditional dessert territory. The pistachio streusel offered nice crunch and nutty butteriness to each bite. 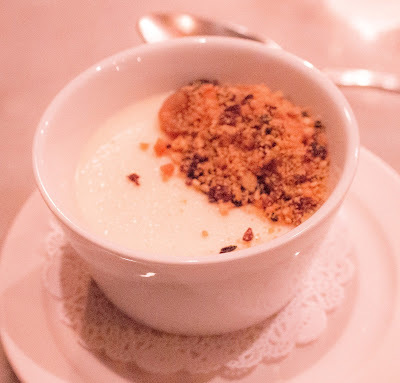 The malted milk pot de creme tasted like an elevated Reese's peanut butter cup and brought forth some childhood nostalgia. Great consistency and smoothness, with the toffee praline and chocolate offering a textural sweetness I enjoyed. 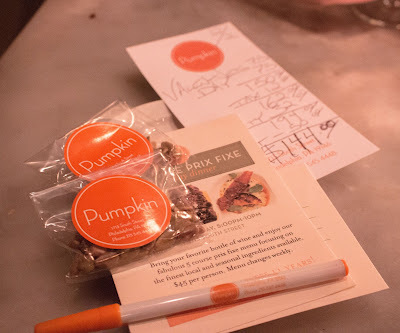 Always appreciated, the meal ends with some toasted, salted pumpkin seeds to take home. Service was impeccable and extremely knowledgeable about each dish. Definitely need to stop by for Pumpkin's Sunday Prix Fixe and not just for Valentine's Day!